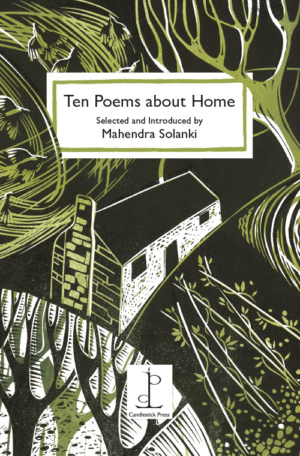 Our latest publication is a beautiful and intriguing anthology of poems selected by Mahendra Solanki. His choices capture the many ways in which we experience that unique sense of being at home. There are poems that evoke “the daily furniture of our lives” and others that echo with the memories of a childhood spent far away. Contemporary poems rub shoulders with more traditional selections to create a haunting sense of what it means to belong. Yeats’s famous poem of longing (evoked in the bewitching cover image created especially for Candlestick by Sarah Kirby) encapsulates the abiding spirit of the selection – and something we all instinctively feel – that home is a place we carry with us always “in the deep heart’s core”. Mahendra Solanki’s poetry has explored notions of home and belonging for over 30 years. His work has been broadcast by the BBC and published in Britain and abroad in magazines and anthologies. His most recent collection is The Lies We Tell (Shoestring Press, 2014). Poems by CP Cavafy, Imtiaz Dharker, Thomas Hardy, Tony Harrison, Linda Hogan, Philip Larkin, Grace Nichols, Mahendra Solanki, Wislawa Szymborska and WB Yeats. For reading with your Earl Grey or builders’ brew, with a fabulous introduction by Sophie Dahl (PG with milk, no sugar).